With no other place to go to, Dutee headed home to Chaka Gopalpur, where she watched the CWG on television. Every year, the women of Chaka Gopalpur, a village in Jajpur district of Orissa, eagerly wait for Kumar Purnima. That full moon night, just before Diwali, is when they crowd the Brahmani river bank in their finest. Freshly painted nails, eyes lined with kajal and wearing colourful, sequined clothes, they sing and dance on the sandy beach. This is also when the women, mostly adolescent girls, pray and dream for “handsome” life partners. 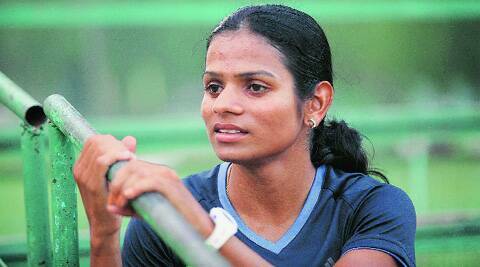 Dutee Chand was no different. The international sprinter, who spends most of her waking hours in track pants and running gear, would start eyeing the steel trunk with festival clothes several days before the night on the beach. Sister Saraswati, 10 years older, recalls how that day, the women of the house — six sisters and the mother — would push and jostle for mirror time. The darling of the house, Dutee, the third of seven siblings, would always get her way. “Even when she was very young, she would pester us to take her to the river. Once she grew up, wherever she was in the country, she would ensure that she would be home for the full moon before Diwali. She would join me in applying mehndi. Her hands were rough because of all the weights she lifted but with her hennaed hands, she would look wonderful. She wouldn’t stop smiling that entire day,” recalls Saraswati on the phone from Cuttack. Diwali is a month away. The family hopes Dutee will be home then but Saraswati isn’t sure her sister would be wearing the sequins, the mehndi and that carefree smile. A few months ago, just as uncomfortable questions about Dutee’s identity began doing the rounds, she had called home sobbing. A coach at the National Institute of Sports in Patiala — where she is training after being away from the sport for two months — had called her ‘Dutee Singh’. Saraswati, a police constable with a temper, was heartbroken. Grief has over-ridden anger. It started on July 12 this year. The family calls it a “black day”. Dutee, who had only a month ago won two gold medals at the Asian Junior Athletics Championship in Taipei, had been told that she wouldn’t be considered for selection for the Commonwealth Games in Glasgow. The reason, rather curtly conveyed to the 18-year-old by a doctor at the Sports Authority of India (SAI) centre in Kengeri, near Bangalore, was the presence of excess androgen (specifically testosterone) in samples collected from the newly-crowned champion. After her Taipei gold, whispers of her ‘masculine build’ had grown stronger and the Athletics Federation of India (AFI) had asked SAI to test her for excess androgen. For the daughter of a weaver couple in Orissa, none of this made any sense. Why were they telling Dutee her androgen levels when she had only undergone a routine dope test? At least that’s what the doctors in Delhi and later in Kengeri had told her. But Dutee remembers being edgy when they asked her to go in for an ultrasound test. “I had never heard of an ultrasound for dope. I simply trusted the doctors and officials,” she says. A few days later, she was asked to give her samples. “I kept wondering why I was being tested in Delhi and Bangalore,” Dutee says. In a matter of days, Dutee, who was being hailed as the next sprint queen of Asia, was staring at an abyss. Newspapers and TV channels knocked at her family home in Orissa and asked her mother if she was “ladki ya ladka”. Besides grappling with an identity crisis, Dutee was being forced to make a complex decision: go in for therapy or challenge her forced exile from the track at the Court of Arbitration for Sport. Those around her were divided. There were some who asked her to undertake therapy or even surgery, saying that would see her return to the tracks swiftly. “Caster Semenya, South Africa’s 2009 World Champion in the 800 metres, did the same,” they advised. But Dr Payoshni Mitra, a research consultant on gender and sports issues who has been working with Dutee and SAI ever since the results became public, cautions against any such surgery. “The current policy that requires women athletes with hyperandrogenism to undergo therapy or surgery if they want to compete again is encouraging genital mutilation in an institutionalised way,” says Mitra. A New York Times article talks about the perils of medical correction as advocated by the International Association of Athletics Federations (IAAF). “Clitoral surgery impairs sexual function and sensation; gonadectomy (removal of ovary or testis) causes sterility; and hormone-suppressive drugs have side effects with potentially lifelong health risks,” it says. It’s tough to say if Dutee is scared, confused or even understands what she is dealing with. “I have watched a documentary on Caster Semenya. I am inspired by how she made a comeback. But I want to remain who I am and compete again. I have lived my life as a girl,” says Dutee. At NIS, Patiala, coach N Ramesh puts Dutee through the paces on the synthetic track. 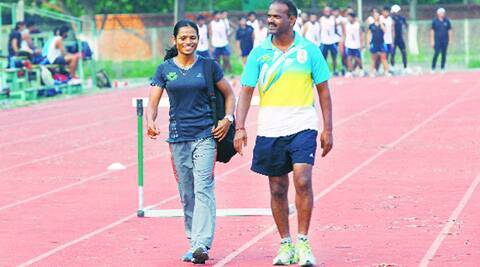 The coach has been with her since her early teens when she shifted from Bhubaneswar to NIS, Patiala, that utopian sporting island isolated from the rest of the world. Ramesh and Dutee go back a long way, back to the times when he coached Saraswati. It was Saraswati who had brought her younger sister, then 15, to the coach. “She was like any other girl. What made her stand out was her speed. Dutee runs like the wind. People may say uncharitable things about her now, but to me, she was like any other woman athlete, except that she was faster than all of them,” says Ramesh. Back on the familiar NIS track, Dutee wants to make up for the training she has missed in the last two months. However, her warm-up is disrupted by a video cameraman looking to get shots for a feature that would compare her case with Semenya’s. Far from being irritated or embarrassed, Dutee seems to enjoy the attention. Later, with a giggle, she asks the cameraman when the video would be telecast. Dutee is surprisingly tiny for an athlete who can squat 150 kg during weight sessions and her build is nothing unusual for a 100 m woman sprinter. But there are a few sniggering looks from a few of the evening trainees on the track. An onlooker suggests her walk is too masculine, her muscles too well-developed. Dutee pays no attention. Support comes from those who have known the 18-year-old for longer. The national campers, who have shared hostel rooms and coaches and who know the athlete since she first arrived in Patiala, speak affectionately of her. Training along with Dutee, Ratandeep Kaur smiles as her friend stretches a bit longer so that the cameraman gets his shot. “Normally we don’t miss athletes too much when they leave the hostel. But when Dutee left for her home, we actually missed her and were hoping she gets back soon. She is very good-natured, nearly everyone has been her roommate at some point of time,” she says. Kaur talks of the time Dutee bought a new cycle to get around the campus. “Someone borrowed the cycle and she got upset. But Ramesh sir said she shouldn’t get upset because it was only a colleague who had borrowed it. After that day, Dutee removed the lock from her cycle so that anyone could use it,” she says. If the disappointment of missing the Commonwealth and Asian Games didn’t hit her too hard, it’s because her fellow athletes were encouraging and told her how badly they wanted her to come along. “Sometime back, everyone was so sure that I would go for the Asian Games. When all of them were leaving for Delhi, they told me that they wished I was with them. I was feeling bad that I wasn’t going with them to Incheon, but I was happy that they wanted me to come as well,” she says. Dutee faces an uncertain and challenging future. Ashwini Akkunji, another athlete who was tipped for greatness but saw her career curtailed by a doping scandal in 2011, says Dutee has it tough, but she also has things to be happy about. “When I returned to Patiala after the doping ban was over, it was hard to get back on track but I had the support of the other girls who were also returning after the ban. Dutee doesn’t have anyone who is in the same situation as she is. No one but she can understand what she is going through,” she says. “At the same time, Dutee has been lucky. She has got support from the SAI and her state government. It’s good to know that there is somebody fighting for you,” she says. Another thing in Dutee’s favour, Akkunji says, is that the youngster is so focused. “She is someone who simply loves running. Other things rarely bother her,” she says. But while the campus has been non-intrusive, things have not been perfect, like when a coach called her ‘Dutee Singh’. Ramesh, however, goes to great lengths to ensure Dutee remains positive. “I keep telling her how she has a job in the Railways that she got earlier this year. She had an offer of a stipend from ONGC, which a lot of people suggested she take, but she told me she would take the Railways job because who knows what would happen in a year. At that time, it seemed a strange thing to say but I am glad she made that decision,” Ramesh says. “There have been a few cases of athletes in similar situations who have taken extreme steps. This must not happen to Dutee. She is too talented for us to lose,” he says. Ramesh, however, admits there are moments when the youngster betrays the turmoil she is going through. “On our way to Delhi, Dutee was telling me she should have a movie made on her,” Ramesh says. “Why are you running like this? Are you an andirachandi (Oriya for a tomboy)? 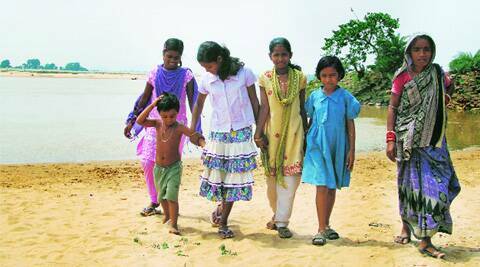 Are you not going to get married?” These were questions that villagers often lobbed at Dutee when she sprinted up and down the dirt and narrow track of Chaka Gopalpur village. A gleaming red Tata Nano car is parked in the backyard of a house built under the Indira Awaas Yojana. Growing up in this two-room house with her five sisters and a brother, Saraswati says, there was little “entertainment”. They didn’t have a television at home and the sisters never discussed “favourite movie stars”. All they did in the evening was run on the beach. Saraswati says those were the best days of their lives. “Even today, I ask Dutee to remember those days. She needs to remember that she started running for the sheer love of the sport. Athletics has given us so much. I told her to recall the number of medals she had won while participating in India and abroad. People forgot that she was a simple girl from a small village who loved to run. And now they say she failed a gender test. Can someone be a girl for 17 years and 11 months and suddenly become a boy in the 18th year? It was a ploy to stop her from going to the Commonwealth and Asian Games. But I am not going to allow people to malign my sister,” says Saraswati. Dutee has faced these barbs before, even as a Class V student in the local upper primary school. “She used to outperform all the girls in school. They would complain to the teacher and ask for Dutee to compete with the boys,” says Saraswati. Those barbs never bothered Dutee then, but they do now. Sensing that her younger sister was getting increasingly frustrated after the test results, Saraswati came up with an idea of a protest, though she now admits it was perhaps a bizarre suggestion. “I advised her to wear her medals around her neck and take the same flight as the athletes travelling to Delhi from Bangalore, before they left for the Glasgow Commonwealth Games. I told Dutee it was the only way someone would come to her aid. We needed to highlight her plight as everyone was trying to wash their hands of the issue,” says Saraswati. Dutee too tried reaching out to officials but none listened. “I called up a top AFI official when I was initially told that I would not be able to participate in the Commonwealth Games. He told me not to worry and continue training. He promised he would call me back in half an hour. He never called. Moreover, he has stopped taking my calls,” Dutee says. However, support came when the Department of Sports and Youth Services assigned two women coaches to accompany Dutee back from Bangalore to Bhubaneswar. With no other place to go to, Dutee headed home to Chaka Gopalpur, where she watched the Commonwealth Games on television. “My parents are weavers who know little about the outside world. When media people came home wanting to talk to me about my predicament, my parents were very disturbed. They earn about Rs 500 a week weaving a sari or a shawl. They are simple people who were proud of their daughter’s achievements. I think the whole episode was a bigger shock for them,” Dutee says. Such was the media glare on her and her parents — Chakradar and Akkaji Chand — that she decided to leave Chaka Gopalpur. “My sister told me to go and stay at a friend’s house in Bhubaneswar,” she says. Dutee says the only time she could flush July 12, 2014, out of her system in these days of trauma was when she was running alongside Brahmani river on her short trip home. In a month’s time, she hopes to be on her favourite beach once again. She is looking forward to opening the large trunk with her sequined clothes inside. And this time round, she wouldn’t be praying just for a handsome life partner.